​At Stan State Campus Recreation we offer many fitness programs. Health Related Physical Fitness Components are selected to enhance health, wellness, and the overall quality of life (Ratamass, 2012, p. 10). 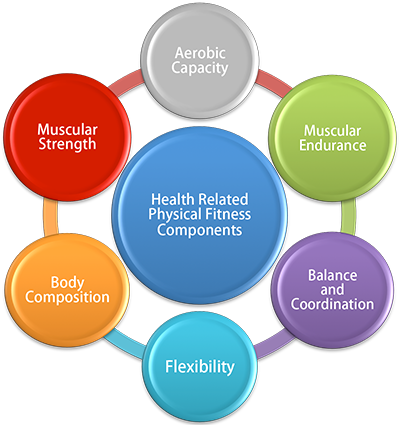 Click on any of the Health Related Physical Fitness Components for more information on what fitness is and how we can help you accomplish your fitness goals. Classes are open to regular enrolled students as well as faculty, staff and alumni with an SRC membership. Warrior ID required for entry. Not able to attend a scheduled Group Exercise class? Then workout by DVD is for you! Some of the available DVDs include Pilates, Bootcamp, Cardio Dance, and Yoga. Looking for the secret to fitness success? Here are some general valuable tips. Choices you make really affect your health and wellness, here are some tips for healthy living. If you want to take a more hands on approach to training, Campus Recreation offers low cost personal training.